We had our first "snow" of the season a week or two ago. It wasn't anything big. It basically just made the ground wet, but was a very strange snow. It was evening and I had to make a quick run to the store. By "run" I mean drive. Anyway, it had been kind of windy most of the night and I do recall seeing a slight chance of a "single" snowflake in the forecast, but it wasn't anything to be concerned with. So, I put on my coat and headed out the door. As soon as I stepped onto the porch I noticed HUGE snowflakes whipping about. "How nice," I thought. I got into the car and headed for the store. 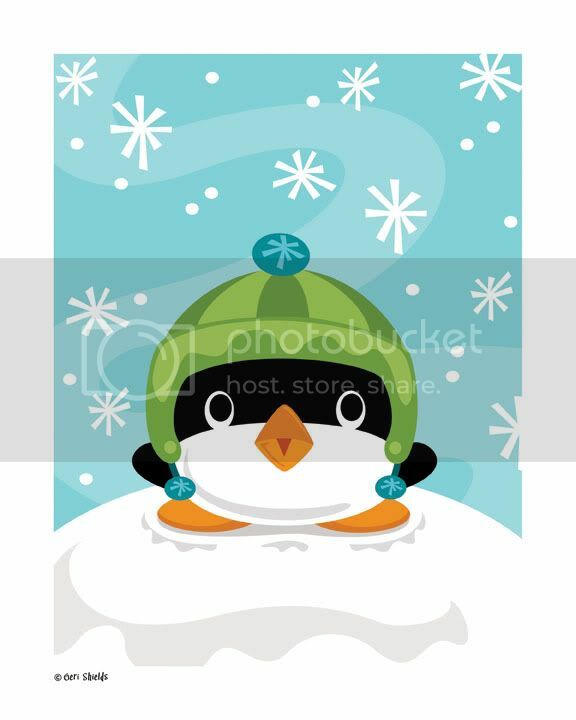 By the time I got on the main road, those HUGE, fat snowflakes were falling harder and faster. It almost seemed like a bizzard. The snow was coming down so "thickly" that I couldn't see to drive. It was actually kind of scary. I did make it to the store without incident. When I got out of the car, the ground was just wet, like it had been raining, not snowing, but the snow was still falling heavily. Before walking into the store, I took a few minutes to just stand in the parking lot and look up at the snow filled sky. It was refreshing, and kind of magical. It almost felt like standing in a snow globe. What a nice start to...fall? 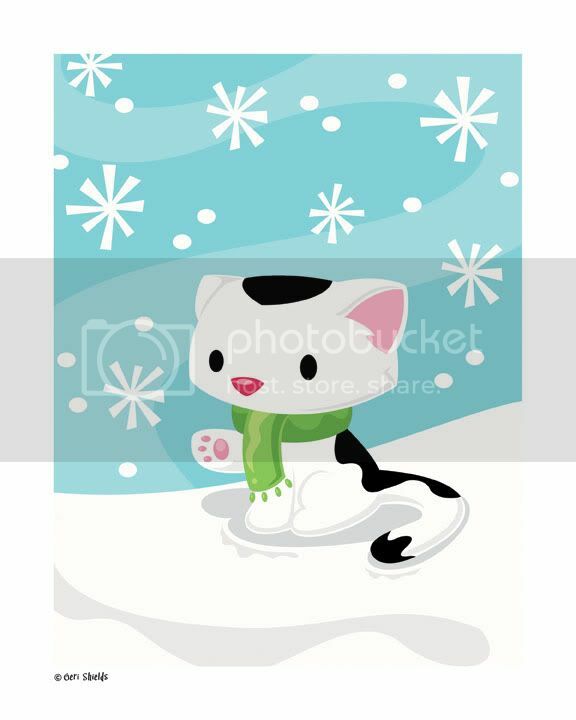 Being inspired by the first snow, I came up with some winter illustrations to try and transition myself from Halloween to the winter holidays. I hope you enjoy them! Prints are available in my shop. It's been dry in the painting department lately. I decided to take a break and concentrate on some personal and household projects. Aside from the non-art related projects, I have been fairly busy at the computer. 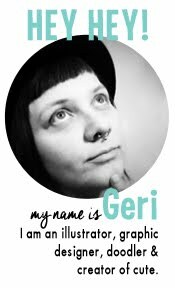 I've been working on some designs for a dear friend. He asked me to come up with some shirt designs for the first and second grade classes at some local elementary schools (Welch and Struble). 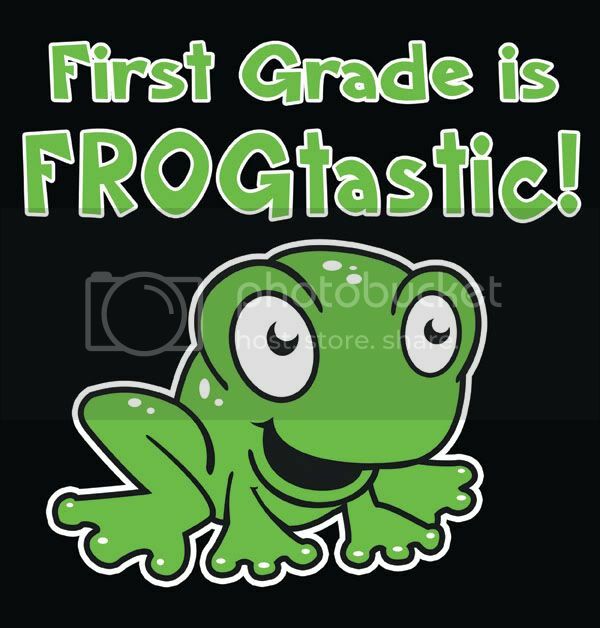 The first grade shirt was to say "First Grade is FROGtastic!" 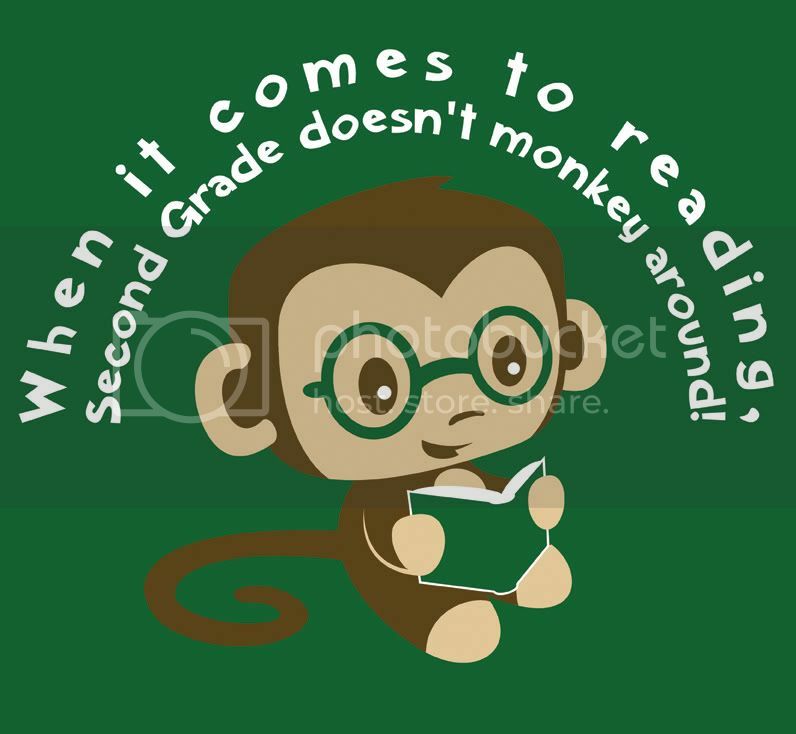 and the second grade shirt was to say "When it comes to reading, Second Grade doesn't monkey around!" I was very happy with what I came up with (especially the for the monkey shirt) and apparently the kids were as well! Thanks, Eric, for giving the opportunity to design these shirts! It was a lot of fun, and I'm glad they were so well received! Seems like I'm always trying to play catch up on here, but I'm trying to get better. Halloween has come and gone and I am sad to see it go. I had a lot of fun this year. Though I seemed very busy with the party preparations and taking down the "Little Conversations" show, I did manage to make some time for pumpkin carving with Zach. This year we set up a table in the kitchen and watched The Howling 2 while we gutted the pumpkins. 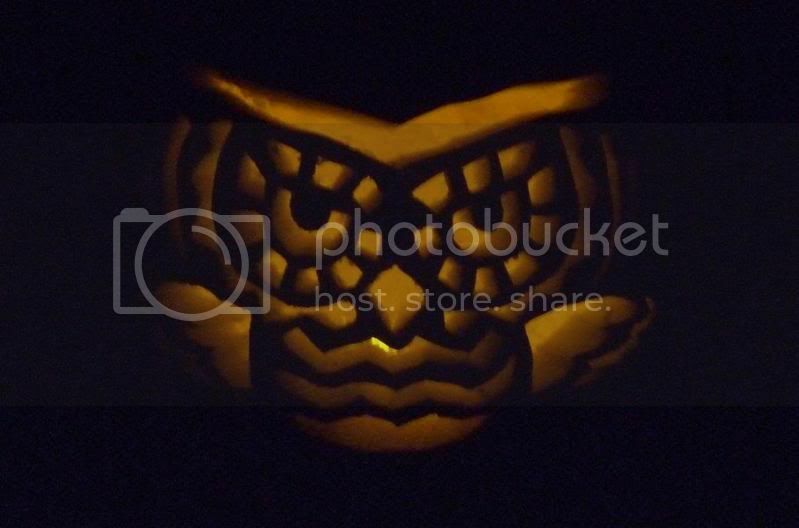 I was pretty pleased with the way my pumpkin turned out. 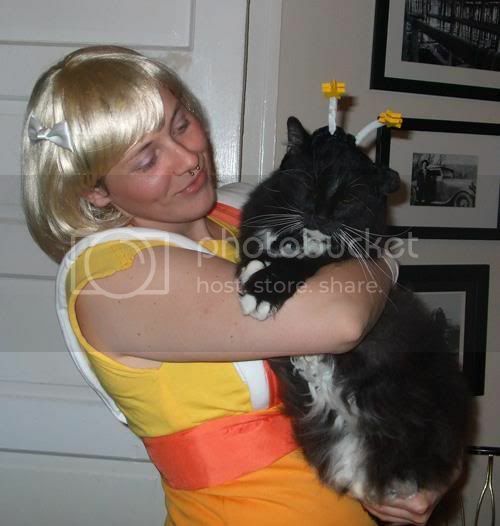 This year, my costume was Canary Yellow from Rainbow Brite. It might seem a little obscure to do one of the Color Kids and not Rainbow Brite, but it was part of a "group" costume. Earlier this year I went to Dragon Con in Atlanta with some friends. Our group costume was Rainbow Brite characters, and my character was the yellow one. My friend was Rainbow Brite. Sadly, I live about 4 hours away from them, so the rest of the bunch wasn't at the Halloween party, but I still rocked my yellow outfit. I made Mr. E my sprite. Mr. F was not happy with the antennae, so he didn't have a costume this year. He was more than happy with that outcome. 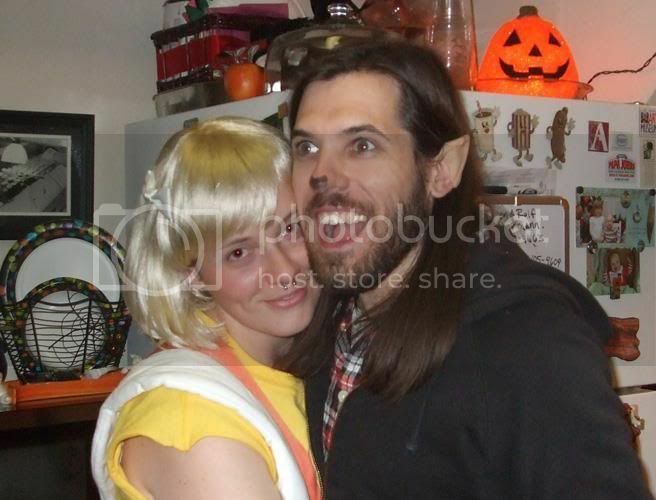 Zach was a werewolf. Can you tell? He likes his costumes to be "minimal." I tried a few new recipes for the party this year. The homemade potato soup was a big hit. I've made it about 3-4 times since the party. It's definitely getting to be soup weather. 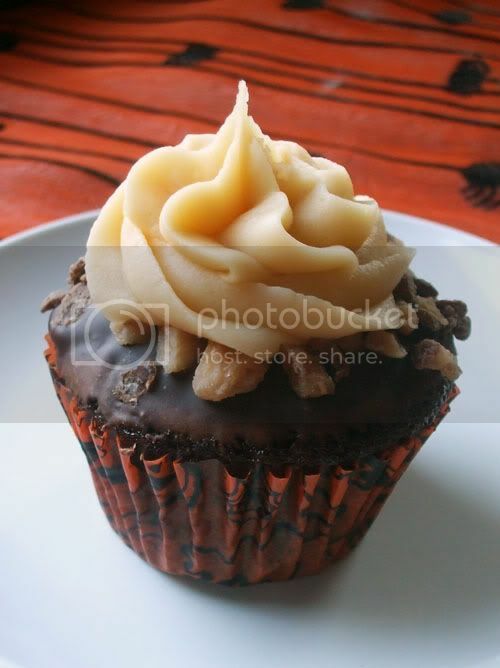 Cupcakes always make an appearance, and this year I made chocolate toffee crunch cupcakes with caramel frosting. I thought they were amazing. 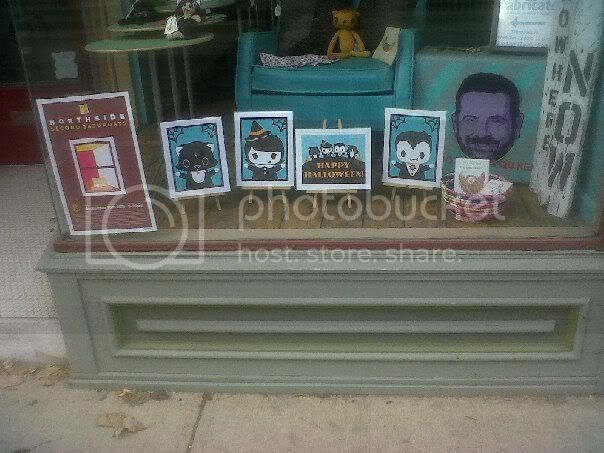 To top of the holiday, a friend of mine snapped a shot of my Halloween prints on display in the window at Fabricate. Don't they look awesome! Thanks to Diane for sending me the pic!